I am keen on understanding the creation, interactions, and maintenance of biodiversity in order to protect it. For my MSc project, I am specifically interested in understanding the mechanisms that influence the expansion of shrub patches in tundra ecosystems. 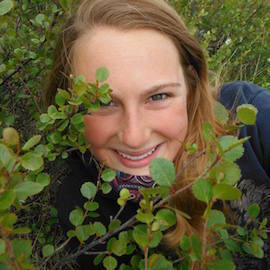 My thesis work focuses on how moisture, topographic features, and nutrient availability control the growth and distribution of green alder shrubs at Trail Valley Creek near Inuvik in the Northwest Territories. I was motivated to become a graduate student by the opportunity to make my own contributions to scientific knowledge. It’s really exciting to perform research that has never been done before to eliminate the gaps in the knowledge of a particular field. In addition, the multitude of skills that I am developing from my graduate degree will help me to succeed in a career in ecology or a similar field. In the north, no matter how much DEET you put on, nothing will protect you from the relentless blood-sucking insects of the tundra. Black works with Jennifer Baltzer, Canada Research Chair in Forests and Global Change. Black has now completed her studies at Laurier.